Footprints in the Butter: Living out of my Pantry: Why is this important? Living from my pantry? Why do I feel so strongly about a well-stocked pantry? 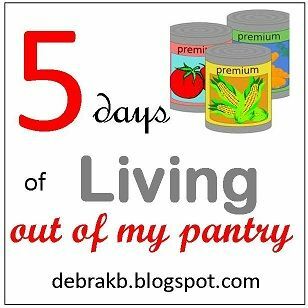 Monday, I talked a little bit about what I mean by living out of my pantry, and a bit about why it is a good idea to be able to. Tuesday I chatted about being able to eat well in a short-term emergency. Today I'm going to tell you a couple of stories. Because the day got away from me, and I just don't have time for the post I planned. Too much of today was spent driving to North Dakota. So why am I so passionate about having a solid, long-term pantry option? We've had issues over the years. More than once. In 2000, we were in a car accident that left my husband unable to go back to his job. I was pregnant, and we had two small children. Because of my pantry, we got by quite well for five months... with a grocery budget of roughly $45 per month. Fast forward a few years, and Dale's wages were garnished for one of the medical bills from that accident. We had four kids at that point. We spent no more than about $10 per month on groceries when the garnishment was going on, and upped that to $35/week for the next six months while we were trying to recover from the mess those couple months made. And doubled it to $70/week for the next three or four months. That was a pretty long year. When our well went out this past year, and all of our "extra" money suddenly had to be diverted to paying for a new pump, we (now a family of 7, including one teen boy, and two tween boys) found ourselves budgeting $25/week for groceries. For a few months. I had $4 to spend for Thanksgiving and our Thanksgiving weekend. And yes, we had turkey with a whole lot of trimmings. And we didn't starve. Most of the time, we ate pretty normal looking meals. We didn't empty our pantry. Though we did have times where things were starting to feel a bit bare. This is why I'm blogging on this topic. This is so inspiring! You should write a cookbook called: The Pantry Cookbook. We always try to eat what we have and buy in bulk when we can. Those "little" trips to the store to pick up one more thing or two really add up! this is so amazing to me. I waste so much of our budget on food and we waste so much, too. very convicting. and very inspiring. you are amazing, friend. For me pantry unit is like an investment in your own kitchen.